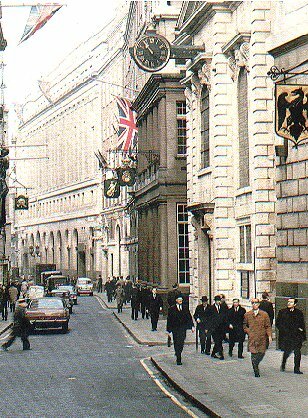 Lombard Street, in the City of London, with the centuries-old signs of the financial houses. Quite near to the City of London you can find old village communities, which have grown up around trades and industries. Some of these areas still house the trades for which they became famous. Clerkenwell, north-east of Holborn, became the home of many Italian refugees, fleeing the power of the Austrian Empire. They began the jewelry and watch-making trade that still thrives here. Today, Clerkenwell Green still gives the impression of a small village, set in a drab working-class area. But there is little to show what an important centre of radical reform it once was. It was here that Lenon printed his newspaper Iskra for smuggling into Russia. Bethnal Green, a densely-populated community, was founded upon the silk-weaving industry, but today it has turned more to furniture and the leather trade. Bethnal Green, as with most of the East End of London, was badly damaged in the bombing of the Second World War, but the community itself was not destroyed. The Cockney people of the East End have a strong sense of comradeship which helped them survive. With its drab houses and over-crowding, Bethnal Green is still one of the friendliest places. Everyone has a cheerful word for you. The owners of the shops and stalls seem to know everyone. Nearby, in Whitechapel, lives a largely Jewish community, where families came to settle after the Russian persecution in 1881. This is a busy clothing centre of which the Petticoat Lane market at Aldgate East is the most famous aspect. Again, one has the feeling of a busy friendly village. Camberwell, in the south of London, was once a fashionable residential area in the time of Queen Victoria. Some of the substantial houses remain, but many areas have been rebuilt. Instead of row upon row of identical houses, tall council flats have risen into the sky. It is hard to find a real community among these soul-less concrete blocks. In many working-class areas of London the village feeling still remains - Battersea, for instance, on the south bank of the Thames. Even though a sprawling suburb, Battersea retains an lod quarter around the church and the old village square. The community is mixed, but many families have lived here for years and are proud of their ares with its beautiful park, and riverside location.